Most modern bicycles come with all kinds of markings indicating the recommended torque for bolts. If you don't reach the torque limit the bolt may come loose, if you over torque it, the bolt may break, or you may crush whatever you were tightening. 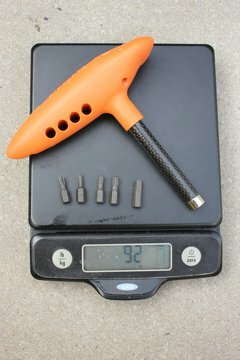 Especially light weight carbon fiber parts are easily crushed. It's hard to say which one is worse, trying to extract a sheared bolt from a thread, or crushing an expensive component. The best time to invest in a torque wrench is before finding it out. The number one reason for me to delay investing in a torque wrench is the price. Most of them are quite expensive. Some cheaper ones have a predefined torque limit. That's pretty nice, but then you will need a whole bunch of them for different torque limits. I based my choice on a comparison test of 17 torque wrenches by Bikeradar.com. 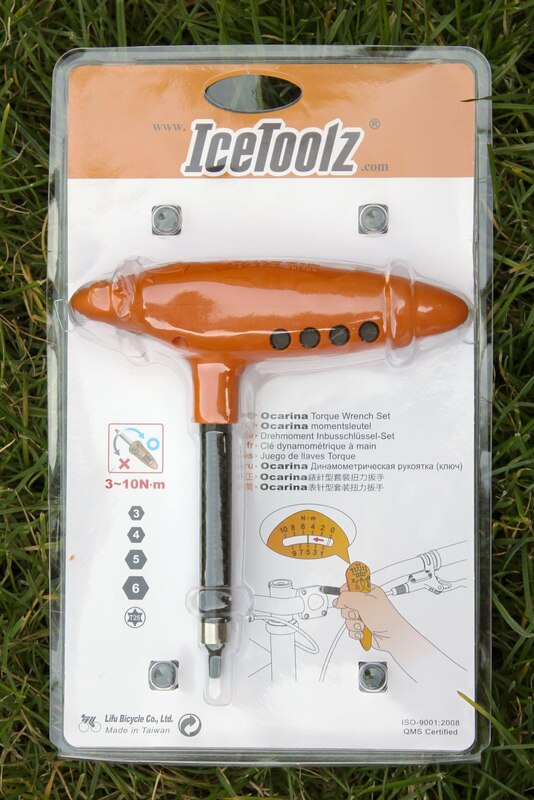 The IceToolz Ocarina torque wrench was the second best value for money. The number one, was however over three times more expensive. I picked up the IceToolz Ocarina for a little over 20 euros. The tool is packaged in a transparent plastic packaging. It is easy to open because it held together with just two staples. Instructions are included on a paper insert behind the tool. No other instructions are provided. On the back there is a list of common torque amounts for Shimano components, a QR-code for the website where you can find torques for other brands. The front of the packaging highlights some of the tool's features. 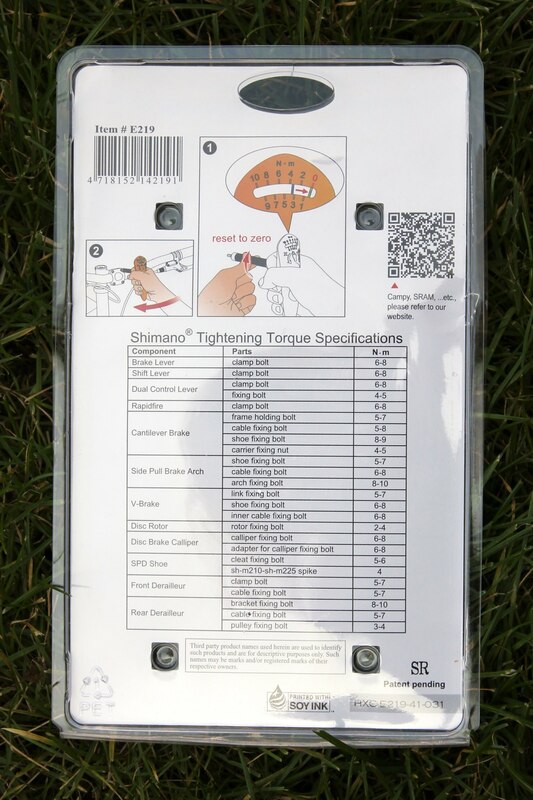 The back of the packaging contains a table of recommended torque ranges for Shimano components. 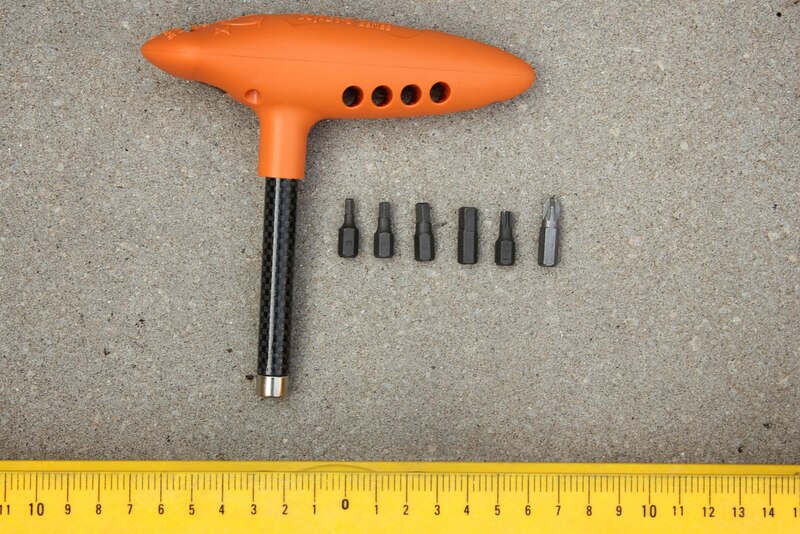 The tool itself has an orange plastic handle (there is apparently also a black one, but it seems hard to find). The two halves are kept together by three screws. On top is the torque indicator with a small yellow needle that moves from the right (zero) to the left (ten) when applying torque to the tool. The package however says that the range is three to ten Nm, so don't expect any precision in the lower range. On the side there are four holes about six millimeters (a quarter inch) in diameter. Inside are hex bits in the sizes 3, 4, 5, 6 and a a T25 torx bit (star shape). These are the most common sizes used on modern bicycles. The bits are firmly held in place with little raised bits inside the hole. 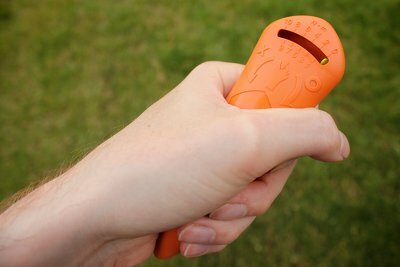 You remove a bit by pushing it through with your finger and pulling it out on the other side. This is a little finicky, when your fingers are too big, you can also push the bit through with another bit that you want to put in. The shaft is made out of carbon fiber. At first it seems odd that an expensive material that is usually used to reduce weight is used here. In this tool however the flexing of the carbon fiber shaft is what measures the torque. I weighed the tool to be 92 grams including the bits, which is quite light for a torque wrench. 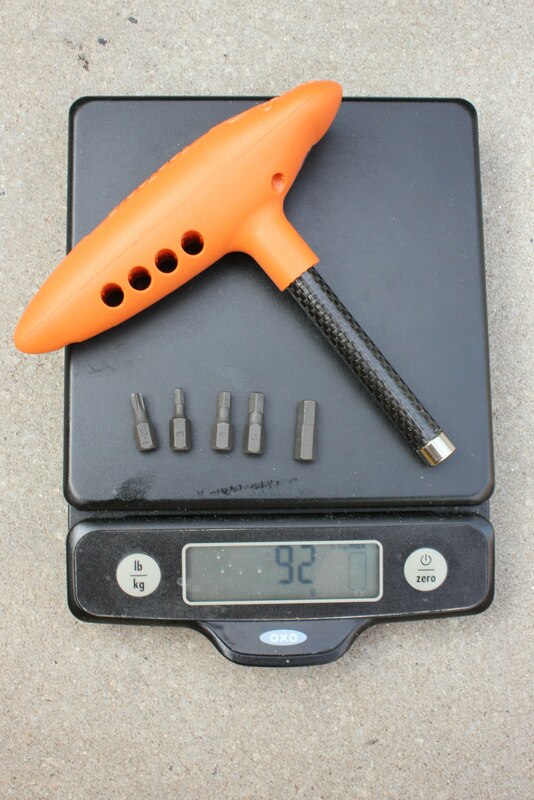 Normally I like light weight bicycle parts, but I don't really see the need to bring this tool on trips with me, but maybe in the future when I have more carbon fiber parts? At the end of the shaft is a magnetic bit holder which also fits standard hex shaped bits. Tool and bits, with an additional standard bit next to it for comparison. I measured the tool to weigh 71 grams, 92 grams with the five bits included. Getting started is easy, just insert the right bit and start turning the bolts. 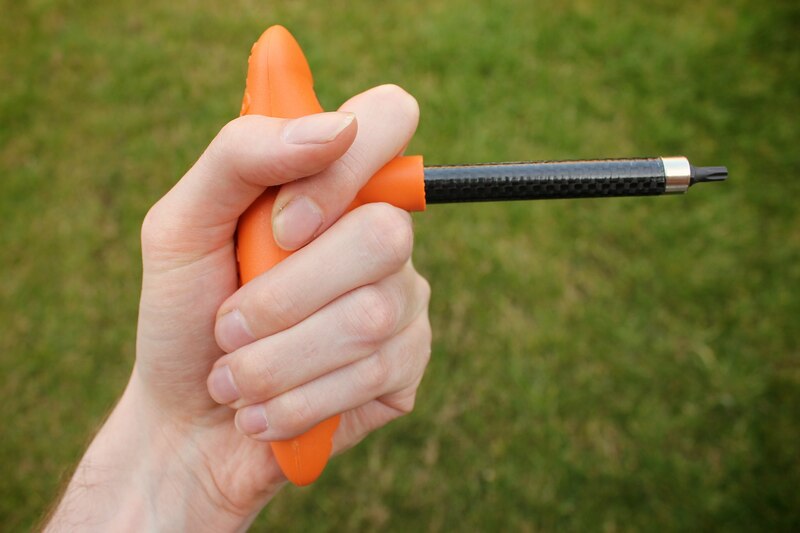 The handle has a comfortable shape that allows for a form grip without the risk of the tool slipping from your hand. Nevertheless, the plastic does feel a bit cheap, not a problem, but not the same satisfactory feel you get when working with a high quality tool. The length of the shaft allowed me to reach bolts in most places I tried. The shape allows for a secure grip around the tool. 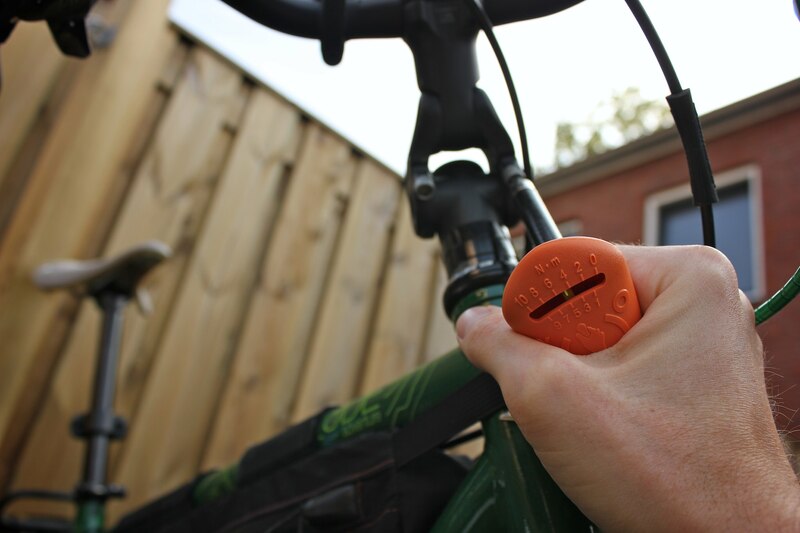 The indicator remains visible while gripping the tool. The shaft is long enough to reach difficult places. The indicator can be hard to read when adjusting bolts facing downward. On the stem I found a bolt that was under-torqued. There was no space to rotate the tool, so I had to re-insert it after every half a turn. When getting close to 10 Nm, it gets quite hard to turn the tool. The size of the handle is not long enough to apply much more torque. On bolts that are facing downwards it is kind of hard to read the torque indicator. It's not so much of a problem when you have the bicycle in a work stand, but I feel like they could have easily made another indicator on the bottom of the handle. The torque measurement only works when turning right. 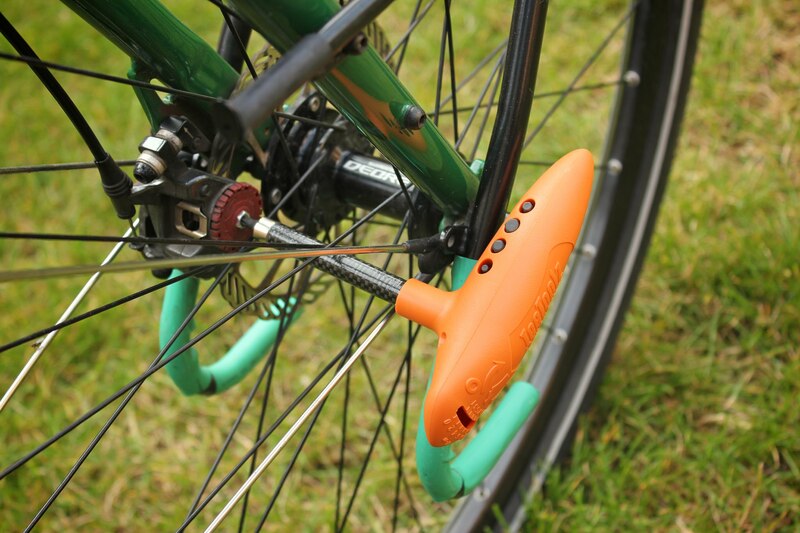 This is OK for most bolts on a bicycle. It does not work well for loosening bolts, the flexing shaft makes it hard to apply pressure. after using the tool for a while the indicator may not reset to zero, to reset it, simply turn the shaft with your hand, this is explained by a drawing on the back of the packaging. The bits are matte dark gray. The size is stamped on the side. It is a little hard to see, and the bits easily get lost. It would have been better if they were shinier, or even better color coded in bright colors. The tool seems to the job is intended for. It allows you to tighten bolts up to the specified torque between three and ten Nm. It may not be the most accurate, but is accurate enough. The included bits are nice, the tool is lighter and cheaper than others that do a similar job. The tool looks like a T-shaped wrench but is not very good for that. It is nice to hold, but the lack of a ratcheting mechanism and flexing shaft just make it not suited for anything else than tightening bolts somewhere close enough to the specified torque range. For now I recommend this tool for anyone who wants a versatile torque tool for the bicycle without spending too much money on it. Long term experiences will be added to this review later.